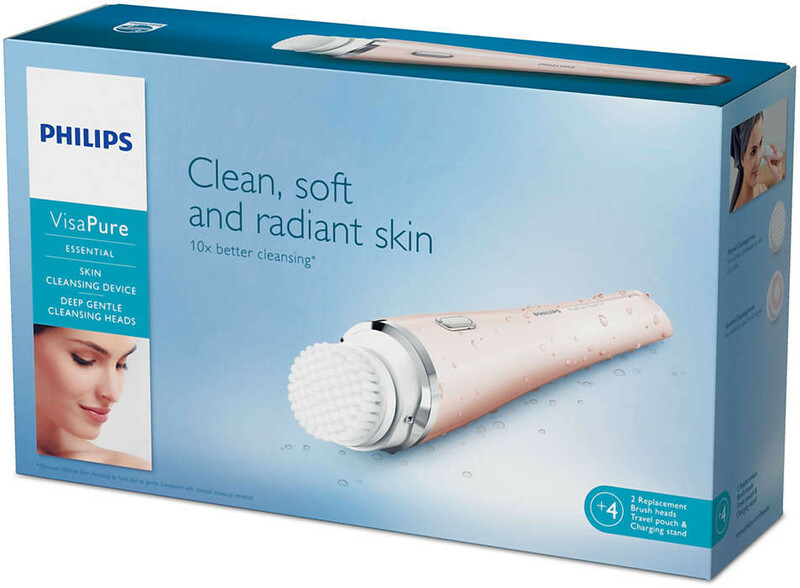 Philips VisaPure Essential brings a new technology that will take your daily cleansing routine to the next level without extra effort. A gentle way of leaving your skin clean, soft and radiant. 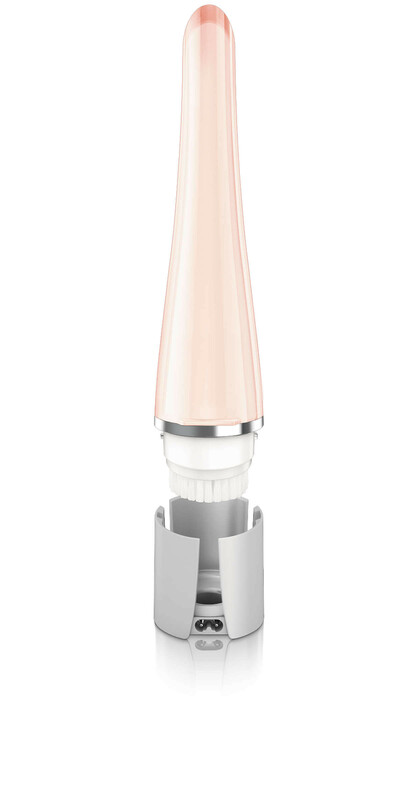 The brush rotates and vibrates. 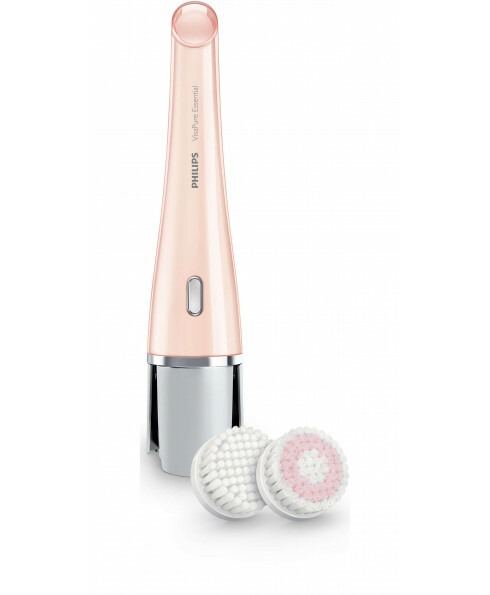 The vertical pulsating movement gently breaks up surface impurities including dirt, dead skin cells and make-up residue. 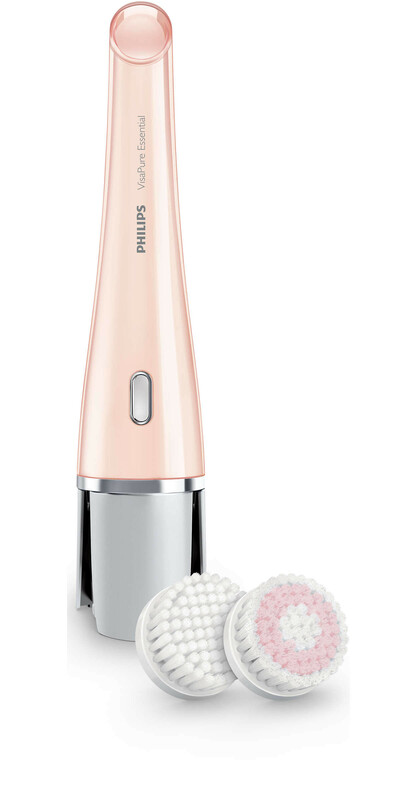 The rotating movement sweeps the impurities away, leaving the skin more deeply cleansed. 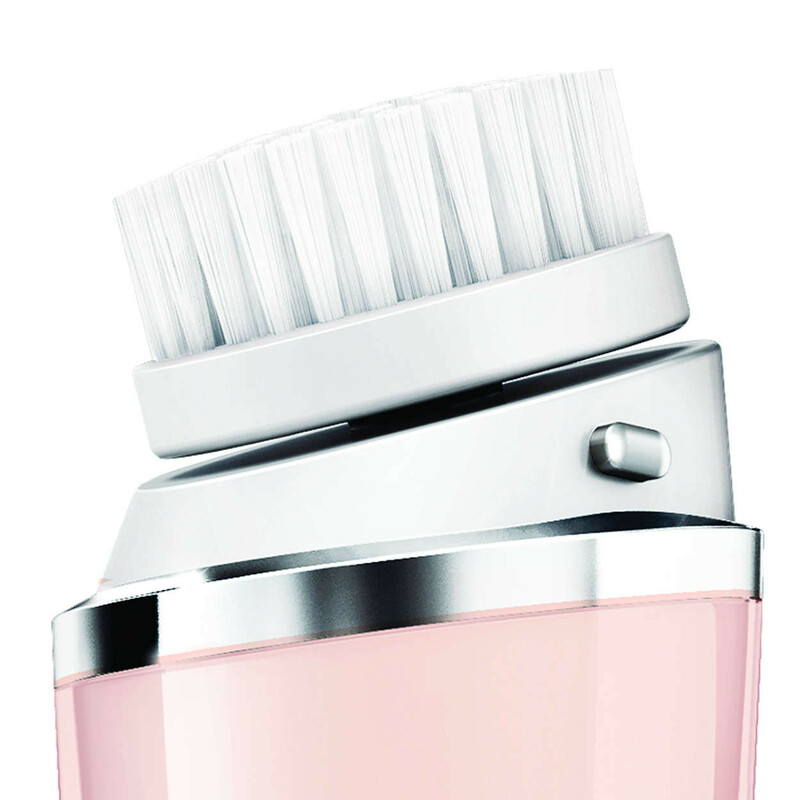 The coordinated movements of the bristles give you a thorough and comfortable cleansing experience. 1 minute program (timer) for the full face. The face can be divided in different zones. The intelligent skinzone timer lets you know through a short pause when it's time to move to the next skin zone. The device automatically stops after a full face program. The Cleansing program lasts 1 minute. With each brush head you use, you can choose two intensity settings, based on your personal preference. 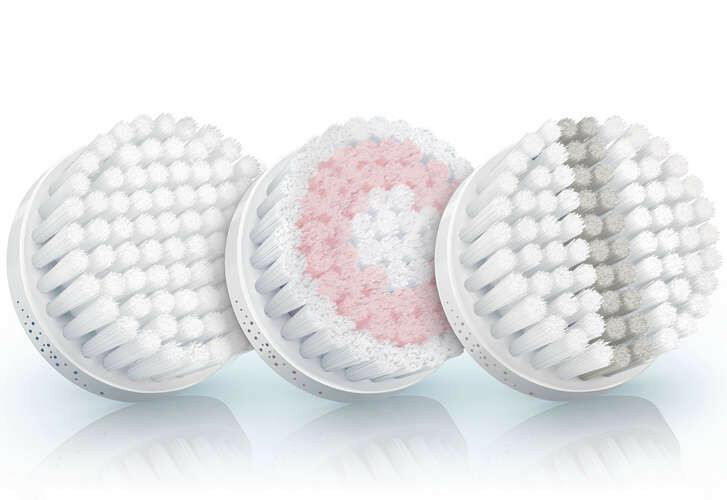 Select Setting 1 if you would like a mild and soft treatment and Setting 2 if you prefer a more intense treatment. Philips VisaPure Essential is waterproof and can be easily used in the shower. 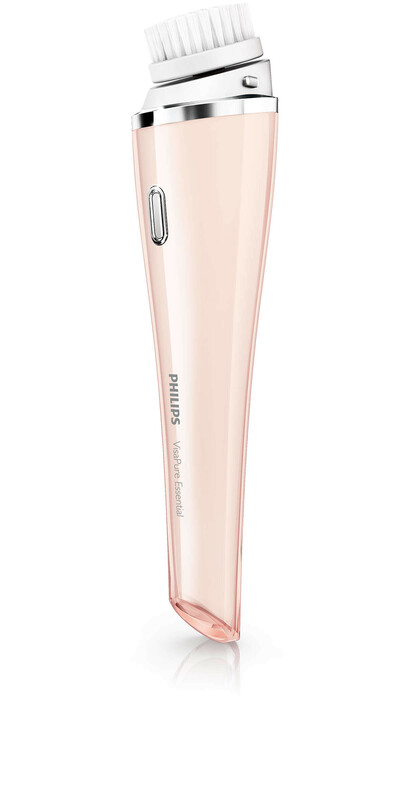 The stand elegantly complements the iconic design of Philips VisaPure Essential. It holds the brush, taking less space and letting air naturally dry the used brush. When connected it fully charges the device in 6 hours. Cleansing with VisaPure Essential means that you remove more make-up residue, dead skin cells and dullness. Thanks to the deep cleansing effect, your favourite skincare products like creams, serums and essences are better absorbed by the skin. The heads are easy to clean. Simply clean them in the sink with warm water and soap. I love this product and it has left my skin feeling great without having to use to much foundation. The Visapure is now part of my beauty routine. Since I have been using Visapure - it has completely changed my cleaning routine. My skin is softer- definitely younger looking and feels completely different. Moisturisers go on much easier too - you need to use less, and you really notice the difference, you don't feel that dryness under your fingers when applying creams. I actually can't get ready in the mornings without it now - it makes you feel really super clean. I have recommended this to everyone I know!